Palestinian poet and political prisoner Dareen Tatour finally returned to her hometown of Reineh, last week, after enduring various forms of Israeli detention for nearly nine months. Her family and supporters joyously greeted her with music, food and fireworks when she arrived to the village on July 26th. Yet, Tartour’s future remains uncertain: she will remain under house arrest and electronic surveillance in her family’s home. Moreover, her trial remains ongoing. If Israeli authorities find her guilty of “incitement to violence,” she will be taken back to prison for up to eight years. Israeli forces arrested Tatour on October 11th, 2015. They charged her with incitement to violence, based on a YouTube video showcasing a poem she wrote titled Resist, My People, Resist Them, as well as two statuses and an image of Israa Abed posted on her Facebook profile. “It is ironic, but not surprising, that I was sent to jail for protesting the killing of my people whereas actual Israeli killers roam free,” Tatour told The Electronic Intifada in April. After her initial arrest, Tatour was shuffled between multiple Israeli prisons for three months. In January, Israeli authorities transferred her to strict house arrest in Kiyrat Ono – a suburb over 100 kilometers away from her hometown. There, in a small apartment her brother had to rent for the occasion, Tatour was trapped with round-the-clock Israeli guards, forbidden from accessing Internet, and forced to wear an ankle monitor at all times. However, between her release from Kiryat Ono and arrival in Reineh, Tatour spent another unexpected night in Israeli prison. At a court hearing on July 25th, the private for-profit ankle monitor company failed to produce a report required to approve Tatour’s transfer to Reineh. In anticipation of “negative reply” from operators of the ankle monitor, the judge detained Tatour. She had expressed that she would prefer jail to the draconian conditions of her house arrest. Tartour court proceedings continued the following day. But, the surveillance company did not produce the requied report. In lieu of the surveillance report, Israeli authorities decided that Tatour should be taken back to prison. 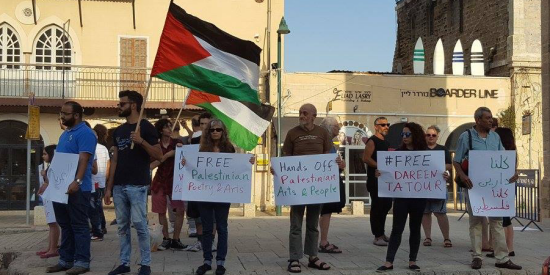 However, when the Israeli guards arrived with Tatour at Damoun prison, the prison authorities maintained the court had “released her” and refused to lock her up. Though Tatour was stranded at the prison for some time, eventually her family was able to rescue her and happily take her home. A meeting with the surveillance company was scheduled for the following day. Indeed, Tartour’s arrest is exemplary of Israel’s increasing criminalization of Palestinians’ Facebook activity since the popular uprising began in October 2015. So far, since October 2015, Israeli forces have arrested 400 Palestinians for Facebook posts. Article author Anna Ty is a poet, activist and student of Anthropology, Gender, Sexuality, Feminism and Social Justice Studies at McGill University in Montreal.